LOQUAT is an evergreen, subtropical fruit. It is available in the market in North India during mid-March –May when there is scarcity of fruits and therefore is able to bring a good income. It is cultivated on a large commercial scale in China, Japan, Korea and Taiwan. It is indigenous to the hills of central eastern China. It was introduced in India under the name of ‘Japanese medlar’. And its commercial cultivation is mostly confined to Uttar Pradesh (Saharanpur, Dehra Dun, Muzaffarnagar, Meerut, Farrukabad, Kanpur and Bareilly), Delhi, Punjab (Amritsar, Hoshiarpur and Gurdaspur), Himachal Pradesh (Kangra) and to a small extent in Assam, Maharashtra and hills of south India. 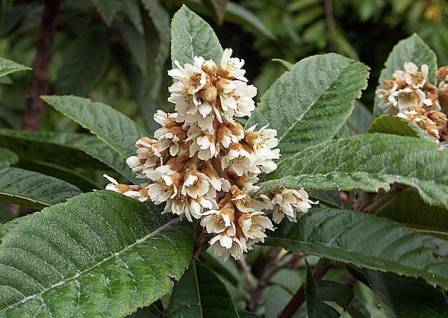 Loquat is specific in its climatic requirements. It needs about 90 cm well distributed rainfall throughout the year. Frost is a limiting factor for its successful cultivation. At certain places, the crop may be destroyed by moderate winter frost, since flowering takes place from October to late January. At -3`C smaller fruits (diameter <9.5mm) are more susceptible to cold injury than larger ones. Likewise, its cultivation is problematic in areas where summer sets in early alongwith hot scorching winds. There may be a heavy loss of crop because of sun burning. 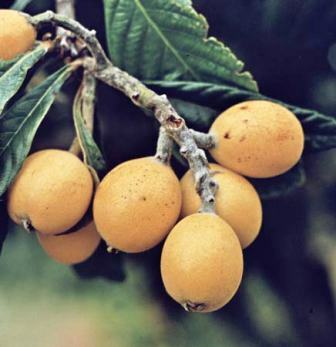 Loquat requires a well drained, deep, sandy loam soil with inorganic matter. A number of varieties having different qualities and harvesting times are available. A good dessert loquat should be sweet, pulpy, mellow and milting and sub acid though pleasant in flavour. It should sustain as few seeds as possible. Golden Yellow: fruit medium oval to oblong, golden yellow. Pulp medium thick, pale orange smooth and soft, mild taste, sub acid, few seeded, TSS, 10.5%. Improved Golden Yellow: fruit medium, oval to pyriform, orange yellow, pulp thick, color orange, smooth and melting, pleasant taste, sub acid and moderately seeded. TSS, 9.5%. Large Round: fruit medium, ovate globose, pulp thin creamy white, coarse and firm, mild taste, sub acid and few seeded. Pale Yellow: fruit large, oblong to pyriform, corn colored. Pulp thin, creamy white, smooth and melting, pleasant taste, sub acid and moderately seeded. Thames Pride: fruit medium, pyriform, marble color. Pulp medium, pale orange, coarse and slightly granular, mild taste, sun acid and moderately seeded. Fire Ball: fruit small, oblong to ovate, saffron-yellow, puop thick, corn husk colour, smooth and crisp, taste mild, sub acid and moderately seeded. Improved pale yellow: fruit medium, oblong pyriform, pulp medium thick, cream colour, smooth and soft, pleasant taste, sub acid and moderately seeded. Large Agra: fruit medium, oblong to ovate, pulp medium thick, pale orange, smooth and firm, pleasant taste, sub acid and moderately seeded. Mammoth: fruit small, oblong pyriform, color snow white. Pulp medium, orange, coarse and granular, pleasant taste, sub acid and few seeded. Matchless: pulp medium, orange, coarse and granular, pleasant taste, sub acid and few seeded. Safeda: fruit large, oblong pyriform. Pulp thick, creamy white, smooth and melting, excellent taste, sub acid and moderately seeded. California Advance: fruit medium, oblong pyriform, pale yellow. Pulp thick creamy white, smooth, melting, excellent taste, sub acid and few seeded. Tanaka: fruit small, ovate, orange colored. Pulp medium, yellow, coarse and firm, pleasant taste and sub acid and few to moderately seeded. The variety California Advance is the best pollenizer for Improved Golden Yellow. Propagation of loquat through air layering is highly successful. Treatment of smooth, old ringed shoots with 3%NAA or IBA2, 500ppm is recommended. Inarching is common of grafting in loquat. Several rootstocks such as apple, pear, mespilus and cydonia have also been used. Budded or grafted plants should always be preferred over seedling plants for planting because they develop true to type plants, which also come into bearing early. Monsoon is the best time for planting. Spring planting may be done where adequate irrigation facilities are available. Planting distance may vary with variety and environmental conditions. It is advisable to keep a distance of 6-8 m.. 75 cm wide pits of the same depth are dug and left for exposure to sunlight for 15-20days. A dose of 40-50kg well rotten farmyard manure and 200g single super phosphate along with Aldrin dust (50g/pit) for warding off termites, should be given. The plants are planted in mid August or mid-February. Generally square system of planting is recommended. A planting density of 180-300 plants/ha is considered profitable. High density planting results in higher yields without any adverse effect on fruit quality. February. There are 3 flushes. Flowers appearing in the first flush are mostly shed, while the crop from the third flowering is generally poor. The major crop is obtained mostly from the second flush (October-November) of flowers. So, a timely and judicious pruning should be made by snipping off 5 cm below the tips towards the May end. Heavy pruning should be avoided, as it seriously hampers the yield. Since loquat is a voracious feeder, it needs heavy fertilization for luxuriant growth and bumper fruiting. A fertilizer dose of 750g N, 300g P and 750K per year to a young plant should be given. Proper and timely irrigation augments loquat yield. Moisture condition of soil should be examined frequently and irrigation decided accordingly. During the swelling of blossom buds, irrigation should be given. Two to three irrigations are recommended during picking season. The soil should be kept in good physical condition by thorough cultivation, addition of organic matter followed by timely irrigation. For getting increased fruit size, application of paclobutrazol (500ppm) around the base of the trunk is advised. Girdling too improves leaf photosynthesis, accelerates fruit development and improves fruit quality. Spraying of GA3 (40 ppm) and NAA (40 ppm) is also helpful to enhance quality as well as yield. Fruit thinning is essential to obtain enhanced fruit size. It is advocated to clip out the ends of bunches whenever there is overcrowding. The thinning should be done when the fruits are less than 1-2cm in diameter. Application of growth regulator NAA (25ppm) is effective. 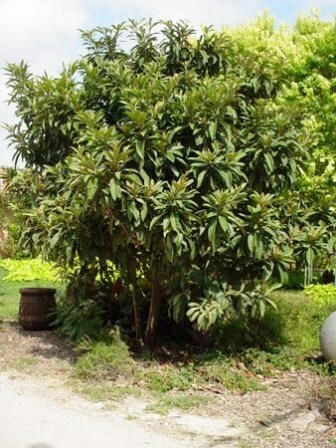 Loquat trees may start bearing 3 years after planting and give maximum yield at the age of 15 years. However, fruits should be allowed to mature fully on the tree. These should never be pulled from tree by hand as it causes decay. The best method is to harvest bunches is with the help of a sharp instrument. Fruit usually takes 70days to mature after fruit set. California Advance, Golden Yellow and Thames Pride should be harvested at 11%TSS. On an average, a loquat tree yields 16-20kg/tree. To save the fruits from sun burn, sprays of 2,4,5-T (20-40 ppm) may be given as it hastens maturity. Covering of developing fruit bunches with paper bags may also prove beneficial. The well managed trees yield 30-40 kg fruits/ tree. during transit. Loquat fruits could be stored for sometime without much spoilage in polythene bags provided the mouth of the bags are kept open. At room temperature, loquat fruits can be kept for 4-6 days. However, the fruits can be stored for 2 weeks at 11 C temperature and 85-90% humidity. A major part of total produce is used for fresh consumption. However, it can also be used for making value added products like jelly, jam, preserves, juice and squash.